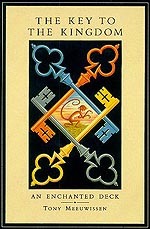 Published by Pavilion Books in September 1992, The Key to the Kingdom comprised a deck richly illustrated playing cards designed by award winning artist and illustrator Tony Meeuwissen, plus an accompanying book of corresponding verses. The object was to use an eighteen line verse to select 14 cards and decode the verses to find a familiar phrase then as a tiebreaker, construct an apt verse of 25 words or fewer, using the words spades, clubs, hearts and diamonds. He'd disappear down to his club! 14 A verse from selfsame pen as Cherry Ripe. 16 That shuffling is, or should be, all you need. 18 The answer by appointment of your mind. In lines 1 & 2 'twice twenty-six' (2 x the number of letters in the alphabet) & 'with cryptic guile' should suggest, in conjunction with Line 15, that an alphabetic code must, at some stage be broken. Line 3 tells us that we're looking for in the first instance - fourteen cards. In line 4 'an insect wedding' = 10 Hearts. In line 5 'the ache disturbed' = Cheetah (anagram of 'the ache')' = 6 Clubs; and 'a man's unlawful house' = crooked house = 8 Diamonds. In line 6 'rare Ben's rhyme' = Ben Jonson ('Oh rare Ben Jonson' is inscribed on his tomb) = 5 Hearts; and 'five operas by Strauss' = 5 bats (Die Fliedermaus = The Bat) = 5 Clubs. In lines 7 & 8 'Dark news from 1912, when sudden strife brought tragedy' = the sinking of the Titanic = 3 Diamonds. In line 8 'a tannin shortened life' = 'Christened in a teapot, died in half an hour' = Ace Hearts. In line 9 'a tellingly precious cephalopod' = 'Tell me oh octopus' (octopus is a cephalopod)' = 8 Spades. In line 10 'a vital joke' = 'Life is a jest' = 6 Spades. In lines 10 & 11 'Where zygodactyls plod around a German countess' = parrots (zygodactyls) around Battenberg (cake) = 2 Diamonds. In lines 11 & 12 'a fruit Sharp words described' = Pear by Robert Sharp = 3 Spades. In lines 12 & 13 'confectionery's cute requests for love' = Love Hearts = 6 Hearts. In line 13 'way in of way-out type' = door without handle = 10 Clubs. In line 14 'verse from selfsame pen as Cherry Ripe' = Robert Herrick wrote Cherry Ripe = 9 Spades. With fourteen cards selected line 15 tells us to 'Decode these cards'. The code (given in lines 1 & 2) is a popular code where playing cards represent letters of the alphabet, running through suits in the usual order, Ace high. Decoding the selected cards gives: I E T D D O M T R N O E I U. In line 16 'shuffling is, or should be all you need' instructs us to rearrange the letters, giving the 'English, yet un-English' (line 17) motto and the final answer: DIEU ET MON DROIT. Confirmation can be found throughout the verse. In line 18 'by appointment' suggests the royal warrant. The second letters of lines 1-9 spells out LIONHEART. In line 16, the word GISORS is hidden in the phrase 'shuffling, is, or should be'. Dieu et mon droit was the motto of Richard the Lionheart at the Battle of Gisors in 1198.